back to the garden... flower power comes full circle: Sebastopol adds second showing after sold out first show! Sebastopol adds second showing after sold out first show! We had such a wonderful Sonoma County reception in Sebastopol! And...met lots of new folks, Special thanks to Jason Perdue and Cynthia Stefanoni at the Sebastopol fest for adding on a second show by popular demand. warm receptive audiences including a Mom who was a part of The Farm commune from Tennessee...and her daughter Salina, who told us they identified completely with the hippie kids' interviews in our film...William who ran the 'Phinny Farm' who remembered Skeeter and is making his own doc about Grass growers in Humbolt county. Emiko Omori, first asian-american camera woman at KQED in San Francisco back in the 60's... at SDFF giving a workshop in the 'Art of shooting Docs' with selected scenes from her influences (Pennabaker, the Maysles brothers, Errol Morris among them). 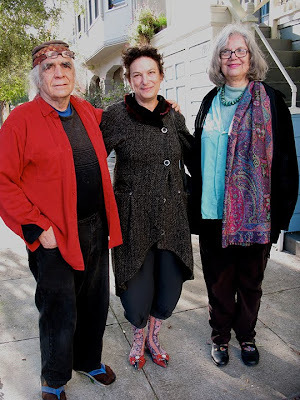 Also met one of the original 'Merry Pranksters' who knew kessey, Brand and many of the Beat Writers of North Beach...He's also an well-known experimental, Avant Garde musician, writer, artist and important memeber of the famed Morningstar commune, Ramon Sender. At 75 he's a dynamo networker who helped us attract several new fans to our Sebastopol screening and has invited us to show "Back to the Garden" in San Francisco in June as a part of his bi-weekly "Odd Mondays" film and Lecture Series.